329 p., 15,5 x 21,0 cm. 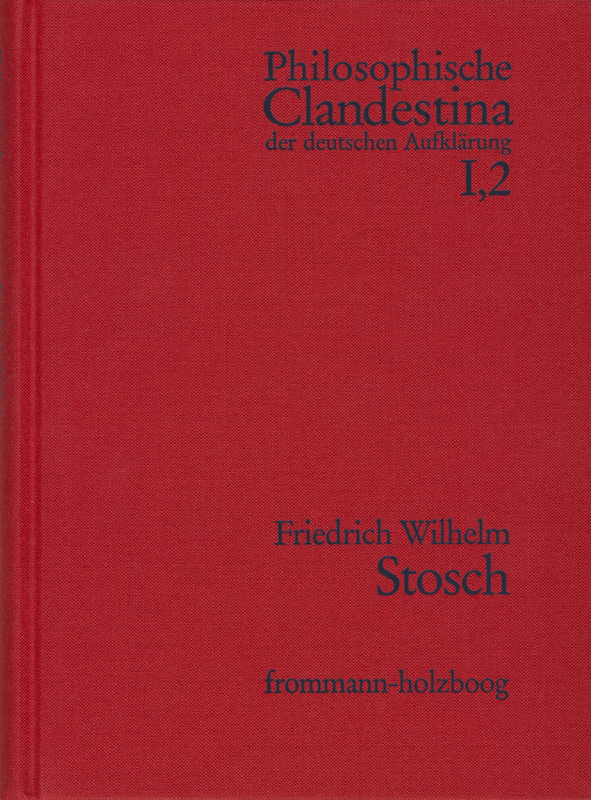 With contributions by Georg Gottfried Küster and Friedrich Wilhelm Stosch. The ›Concordia rationis et fidei‹, of which only a few copies survived, was regarded among theologians as one of the most dangerous spawn of the Enlightenment. Fritz Mauthner believed it to be »the best work of older German freethinking.« It opposes the concept of God in traditional metaphysics, the doctrine of the creation of the world as well as the doctrine of the immortality of the soul and of free will. In his metaphysical materialism, and psychology, his deterministic action theory and a non-deontological ethics and theory of natural law, Stosch at the same time presented the outline of a systematic counterdraft. Numerous theoretical approaches, theories, and frequent direct quotations from Gassendi, Spinoza, Locke (arranged by Jean Leclerc), from Cartesians such as Balthasar Bekker or Dirk van Craanen and Socinian theologians have also been included in this work. These features make it an unusually informative document of its time in the history of ideas. Georg Gottfried Küster: Marchiae litteratae specimen tertium (1743). Ein beachtliches Stück an Aufklärung über die Aufklärung bringt dieser verdienstvolle Neudruck einer wenig bekannten [...] Schrift.